1. Stir water, espresso, 1 tbs sugar, and coffee liquor together in small bowl until dissolved. 2. Beat your egg yolks, Marsala and 1/2 cup sugar together in a metal bowl and set over a saucepan with simmering water. Beat the mixture 5-8 minutes until has tripled in volume. Remove from hear and add marscapone until combined. 3. Beat cream in a large bowl until peaks form, then fold marscapone mixture in thoroughly. 4. Dip both sides of half the 36 lady fingers into coffee mixture and line a 9 x 13 baking pan with them in 3 rows. Spread half the marscapone mixture over them. Then repeat dipping the remaining lady fingers into the coffee mixture and layering them over the first layer. Cover with remaining marscapone mixture. 5. Dust with cocoa powder and chill for 6 hours, then let stand at room temperature for 30 minutes. 1. Simmer 2 inches water in a medium saucepan, then place chocolate and cream in a medium bowl over the simmering bowl to melt. Stir until melted and well incorporated. Then remove from heat and set to side. 2. In a medium saucepan heat the milk over medium heat until tiny bubbles form. Remove from heat. 3. Whisk egg yolks and sugar together until creamy. Add 1/4 cup of the hot milk and whisk vigorously. Add the rest of the milk and whisk vigorously. Then put back over medium heat and stir constantly with wooden spoon for 8-10 minutes until it forms a thick custard. Remove from heat and pour custard through a strainer and into a medium bowl. Then stir in the melted chocolate and vanilla. Allow to cool by covering and refrigerating for 3 hours. 4. Pour chilled custard into an ice cream maker and allow to process until is the consistency of soft serve ice cream. Put into a large container and place in freezer for four hours. 5. When ice cream is ready, brew coffee. Then scoop 2 rounded tablespoons of gelato into a small cup. 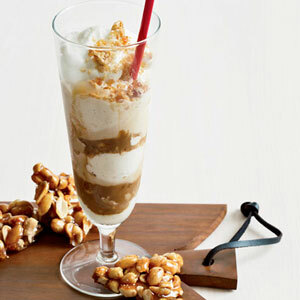 Pour the warm coffee over the gelato and drizzle with caramel sauce, whipped cream, and chocolate shavings. 2. In saucepan, combine 1 cup sugar and water and bring to boil. Cook over medium high heat, do not stir. Wait until caramel starts to form and then stir in peanuts, cinnamon and salt. 3. Pour mixture into baking sheet and spread into even layer. Let stand until brittle is hardened. 4. Break off brittle into 4 medium size chunks. Place remaining brittle in plastic bag and roll with rolling pin to smash into tiny pieces. 5. Whisk condensed milk with instant coffee. 6. In another bowl, beat heavy cream and remaining tbs of sugar with electric mixer until forms whipped cream. 7. Scoop ice cream into 40 bowls and drizzle with the coffee mixture. Sprinkle with crushed brittle and top with whipped cream. 8. Garnish with one of the 4 pieces of brittle on each bowl. 9. Serve cold and enjoy!